LOS ANGELES, Calif. /California Newswire/ — iMobie Inc., a leading software developer for iOS and Android, today announces that its world-renowned product PhoneRescue has taken a great leap forward in data recovery. With a well-optimized UI as well as a high-performance workflow, now it becomes the world’s ONLY productive technique for iOS users to save photos, messages, contacts, notes and more. Built on the most advanced data processing and analysis technologies, the improved PhoneRescue 100-percent securely scans everything in iPhone/iPad, even the data buried for years. It allows you to effortlessly restore data from device, iCloud/iTunes backup, even a damaged iTunes backup. 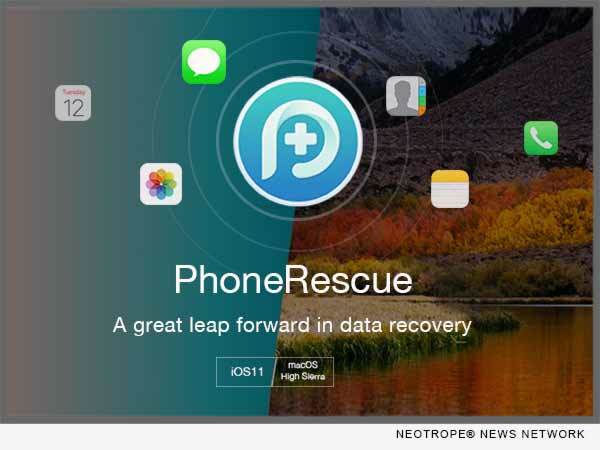 Aside from recovery, PhoneRescue salvages your iPhone from a wide variety of iOS crashes without losing crucial data. Moreover, it’s perfectly compatible with the latest iOS 11 and macOS High Sierra. Armed with NO-DATA-LOSS search engine technology, the re-designed PhoneRescue surpasses all rivals in data scanning. Faster than ever, it scans deeper to find the lost data & files in just a few seconds; no more endless waiting and suffering. Now, you’ll get the most lost data, and retrieve them all in a flash.